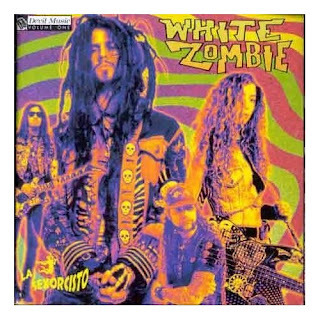 White Zombie's "La Sexorcisto: Devil Music Vol. 1". At the time this album came out, my interest in metal had wained, and I was heavily into punk and the early 1990's alternative & grunge scene. I bought this album, gave it one listen and I was hooked. Metal had never sounded so good. They reminded me of Slayer circa "South of Heaven", slowed down a bit and loaded on LSD. This album is full of heavy grooves, guitar solos that sound as if they came from the bowels of hell, and stream of consciousness psychedelic lyrics chock full of references to horror, B-Movies, and trash pop culture. The music is loaded with samples from several clssssic cult films, including "Night of the Living Dead", "Texas Chainsaw Massacre", and "Faster Pussycat Kill Kill!". A sleazy yet ominous vibe permeates the entire album, and the songs flow seamlessly into one another, bridged together by samples. From the first track to the last, White Zombie transports you into a world full of 1960's and 1970's sleaze, biker babes, gore, monsters, and zombies that you never want to leave. Possibly hands down one of my favorite records of all time. It's one of mine too. In my top three.